On a chilly Sunday afternoon over 30 high school students came together to think about ways to take action for Urban Initiatives. UI Student Board member Hannah Fortier shares her experience at the first meeting of the school year. On November 8th, 33 high school students from the Chicago area met at LYFE Kitchen. This was the first UI Student Board meeting of 2015-2016 lead by Jordan Lantz, Development Assistant and leader of the Student Board, and Kyle Haskins, Development Manager. 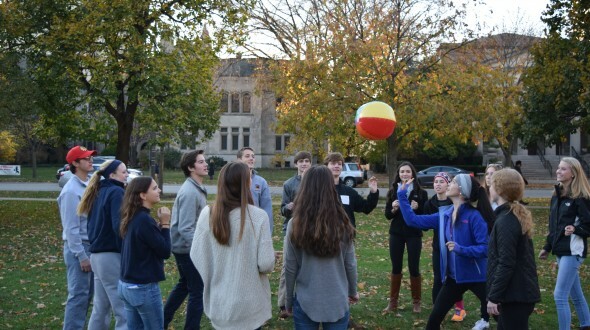 Loyola Academy, New Trier, Latin School of Chicago, and North Shore Country Day School were represented. As a student, I was quite impressed with the turnout of kids and it was great to see a variety of schools present. The UI Student Board is a dedicated, hard-working, and fun group who, together, works to spread Urban Initiatives’ message in their own schools. This initial meeting was designed to bring together students who have worked with Urban Initiatives in the past and/or are interested in volunteering and participating more with the organization. To kick off the event, all the students came to LYFE Kitchen for a brief introduction of Urban Initiatives and to meet one another. After a few minutes, we walked to Raymond Park to play some games. From my past work with Urban Initiatives, this was not a surprise to me. In fact, I was excited that we had the opportunity to be interactive. At UI, this method is used to spark conversation and fun for kids – looks like it worked for high schoolers too! We were split into groups multiple times so that we would always be interacting with new people. We played several games with different objectives to show how our motives change based on the level of competition. After awhile, we walked back to the restaurant to debrief and eat. As a group, we talked about what we learned from playing games, why Urban Initiatives uses games and fun to motivate kids, and our role as Student Board members – including some planning for the upcoming Winter Clothing Drive. Overall, it was a great experience and I’m super excited to continue my work with the student board in the future!